Amelia Spelled is playing Clue at Camino’s house when one of the guests drops dead in the dining room. There was no sign of weapons, so was it Amelia’s food? Or something just as unpleasant but more sinister? The police arrest Camino, so Amelia and her friends are faced with the task of sifting through the suspects. Will Amelia’s attempts to solve the murder be half-baked? What will Amelia do when she finally discovers Alder’s dark secret? All Morgana Best books are clean cozy mysteries. The Kitchen Witch series will suit readers who like witches and wizard books, books about ghosts and haunted houses, supernatural mystery books, cozy crafts and hobbies mystery books, as well as books about witches. Best selling Aussie author Morgana Best grew up leaving Tim Tams for the fairies at the bottom of her garden. Now she lives with a half-blind Chocolate Labrador who happily walks into doors, a rescue Dingo who steals zucchinis from the veggie patch, and a cat with no time for nonsense. A former college professor, Morgana enjoys big bowls of pasta, not working out, and visiting the local lighthouse, where she tries to spot the white Humpback whale. #1 Best-selling Cozy Mystery author, Morgana Best, lives in a sunny beachside town in Australia. She is owned by one highly demanding rescued cat and two less demanding dogs: a chocolate Labrador and a rescued Dingo, as well as 2 rescued Dorper sheep, the ram Herbert, and his wether friend, Bertie. In her spare time, Morgana loves to read cozy mysteries and be walked by her dogs at the beach. Amelia is amazing, she owns a cup cake shop and can not bake to save her life, she recently found out she is a witch but she has no idea what that's all about and she keeps stumbling over dead bodies, talk about hilarity at its best especially when you throw in the magical home Amelia inherited which right now is trying to drive Amelia nuts by making her watch Jamie Oliver cooking shows on a loop, I also love how the house tortures anyone it doesn't like that's just to funny. I loved that Alder Vervain had a bigger part in this story and I really hope Thyme, Camino, Ruprecht and Mint eventually give him a chance. Read all three & was spellbound thru them all. Looking for #4. Can't praise it enough. Deserves 10 stars. This book had me laughing out loud and then...boom...the murder occurs. I never saw it coming. I knew I was reading a murder mystery, but, wow that was one of the best scenes written. This novel about fledgling witch, Amelia Spelled is one of the most complete storylines I've read. 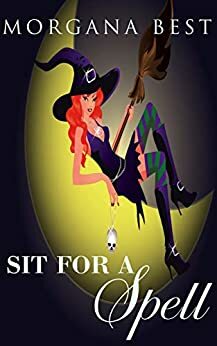 After the murder, Amelia and her new witch friends try to solve the crime. They do a clarity spell, and even sneak into the funeral service to apply a Hoodoo technique. All along you are giggling as you envision, Emus, and various other animals...what? Well, you have to read this to understand as I'm not going to tell you some of the most humorous situations written. Amelia's house has properties that are unique also. It takes protection to a new and satisfying level, even if it doesn't have faith in Amelia's baking! Hey, we all love Jamie Oliver right? The fact that the solution was so well done, and pains from laughing, and the romance is moving gently along with surprises, makes this series a favorite of mine and I can't wait to read the next volume. 4.0 out of 5 starsVery entertaining. I understand so much is new and learning is hard when there is little confidence. I am hoping the newest cook gets a chance to learn her talents sometime before the next body hits the floor. I love her house and cats . In the past three books her talents get muddied with the solving of murders . I hope she gets a chance to discover interesting oddities about herself. There is lots of potential brewing. 5.0 out of 5 starsSuch a lovely series! It has been years since I've found anything of interest to read for pleasure. This series of books however, I couldn't put down. Sadly I now have to wait until the next book in this series is released, hopefully it's soon! I would recommend these books to anyone who enjoys reading about witches (not the usual evil kind, whuch is just annoying), the supernatural, mystery and anyone who wishes to find an entertaining book, appropriate for just about any age. I can't not say enough great things about it. MORGANA BEST,has come through with a wonderfully,humorous series that all ages can enjoy without worrying about racy content. That in its self is a rare bird these days.Mystery abounds as the cast races to find who the killer is,as well as what weapon or poison was the killing factor'. I really liked how fast paced this book was. Good word hiding the identity of the murder. I also liked the confidence Amelia is gaining. Looks like book 4 will be very exciting. I love the touches of humor but you won't catch me in a onesie. Thanks for the presenting the Craft in a positive way.